Recently, a prolific developer by the name of _unwriter released the world’s first native Bitcoin web browser, Bottle. It provides a hint of what’s to come if we choose to rethink how we build applications on a new type of data plumbing system. “Many things we take for granted in the old “web browsing” experience — including the security model — no longer apply in the new world of Bitcoin. The thing is, Bitcoin is NOT “the next web”. In many ways, it’s completely opposite of what the WWW is, which is why Bitcoin is so powerful. What’s occurring right now in the BSV (Bitcoin SV) ecosystem is a flurry of developments that require a different type of thinking. You can’t solve problems using the same thinking that caused them. This is what made Bitcoin so “revolutionary” back in the day, because it got people thinking differently about the world. Unfortunately, if you’ve been paying close attention to what’s happened over the last decade, the Bitcoin most people know (BTC) has been subverted (via the promise of Lightning Network as a scaling solution) to something that is no different to what we already have. In my opinion, this has been Bitcoin’s biggest setback. Fortunately, Bitcoin had a way of preserving itself through what was known as forks. As a result, two key hard forks took place over the last couple years, which resulted in Bitcoin Cash (BCH) and Bitcoin SV (BSV). Like nature, or reality itself, it is neither perfect (Regular, High L, High C) nor completely random (Low L, Low C). If looked at through the lens of a security expert, it is not completely secure — but secure enough with the economic incentives used to combat some of the potential attack vectors. Social networks like Facebook, Twitter, LinkedIn, etc. are also based around this concept of SWNs. Another way of understanding SWNs is through the concept of 6 Degrees of Separation. You may be familiar with the term from the 1993 movie of the same name, or even witnessed it unknowingly when looking at first, second, or third degree contacts on LinkedIn. Six degrees of separation is the idea that all people are at most six social connections away from each other. As a result, a chain of “a friend of a friend” statements can be made to connect any two people in a maximum of six steps. It was originally set out by Frigyes Karinthy in 1929 and popularised in an eponymous 1990 play written by John Guare. It is sometimes generalised as the average social distance since it seems logarithmic in comparison to the size of the population. As mentioned, LinkedIn will show you up to third-degree connections. I have rarely (if ever) met anyone outside of first or second-degree connections. And, since the maximum is six, LinkedIn shows just how small our world feels, and this is important if you want to understand why companies like Facebook are now shifting their mission statement towards more meaningful connections over sheer numbers. According to the American Psychology Association, a “sense of community” is the feeling that members matter to one another and to the group, and a shared faith that their needs will be met through their commitment to be together. This sense of community is an important factor in determining trust levels within a group. The higher the trust, the higher the sense of connectedness and camaraderie. However, it is important to note that connectedness does not mean connection. Back to talking about Facebook, after it shifted their mission statement, organic business page visibility was greatly reduced (unless paid via ads) and the algorithm was shifted to display actual friends and family posts and increase focus on smaller, tighter-knit Facebook Groups. In the beginning stages of the social network era, we saw an explosion of open platforms. Now, we’re starting to see a contraction whereby individuals are preferring smaller messenger groups and/or more intimate viewing experiences (e.g. Snapchat/Instagram Stories). If you’ve lived long enough in this world, you will know that over time it’s far better to have a small, close group of friends than it is to have many acquaintances that you have no real deep relationships with. Communities, or that “sense of community”, comes from high trust, strong bonds, and deep relationships with fewer people. Why? Because it’s harder to go deep with more people — there just isn’t enough of you, or your time, to create authentic relationships both ways through volume. But, you can leverage the “small world effect” to achieve that sense of community. More connected than ever, but also disconnected. The same applies to the world of Bitcoin. 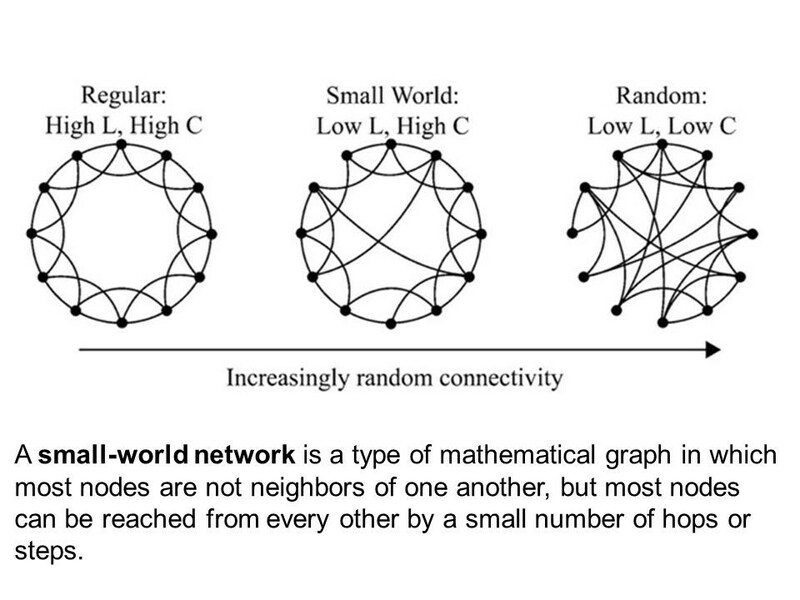 The network stays decentralised enough through a minimum number of “hops” (or degrees of separation) between nodes. This makes it so that not every single individual in the world needs to be a “node” (a computer or CPU used to check, validate or mine Bitcoin). Only a few need to be, so that the rest of the network can feel free to transact safely. Because, at the end of the day, despite how rational we think we are, the majority of humans are driven by emotions. So what does this all mean for the future of social media? If we think of Bitcoin, not just as cash or a “store of value, but a system, we can start to rethink many of the applications we currently have in the world with new eyes. We are seeing an increase in the abuse of automation in the form of bots, anonymous trolls, and cyber-bullying. Imagine a world where you may need to pay (in the form of micro-transactions) in order to comment, post, or reply. Mind you, this is already taking place on various sites such as Yours.org and Steem.it. If someone really wanted to post negative things, en masse, it may cost them an arm and a leg to do so. Now, some will, of course, be willing to pay this, but then what? Well, if data/transactions are being sent via Bitcoin (as the underlying plumbing system), all things get traced back to its source. It makes it very easy to track down if absolutely needed. This starts to shift people towards more honest behaviour, as it brings in accountability. With personal keys, Bitcoin removes the need for things like usernames, passwords, 2FA, etc. You hold your keys. Other providers then need to request access to your data from which you could potentially be paid for directly, and in real-time, versus how it’s currently set up, whereby you give your data over freely and then lose out on any money made by third-parties selling your data. Whenever something like an image, video, audio file, etc. gets copied, the piece of data’s original source (currently contained via OP_RETURN within a Bitcoin transaction) can be traced back and attributed correctly to the source owner and their original transaction ID. Now, we haven’t even covered how communities have formed around Bitcoin (as an idea) itself, but if we wish to truly innovate, we must discard all that we think we know. We must start from scratch, but with lessons learned from the past. Is Bitcoin (as a system) still worth keeping an eye on, in terms of reshaping our global financial/social infrastructure? The post The correlation between Bitcoin, social networks and “sense of community” appeared first on e27.